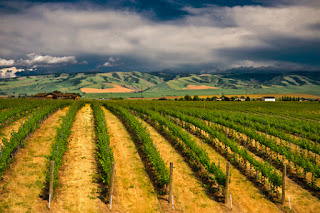 Below is Part IV of a report from the Walla Walla Valley including wines from àMaurice Cellars, Seven Hills Winery, Tamarack Cellars, Pepper Bridge, and Amavi Cellars. Read Part I here, Part II here, and Part III here. Photographs by Richard Duval. Click on the pictures for larger images. 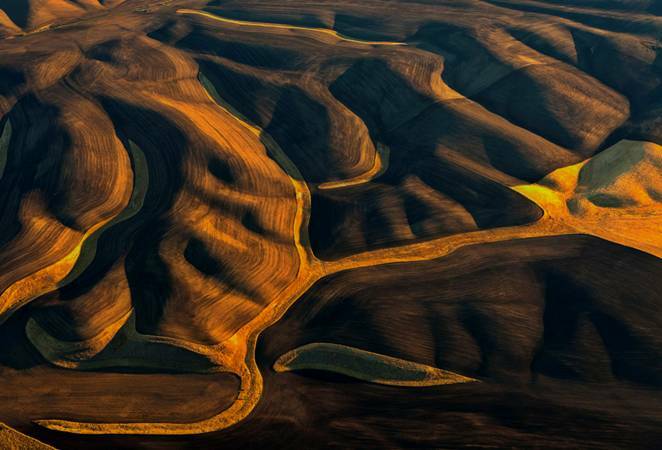 At left, an aerial view of the Walla Walla Valley. 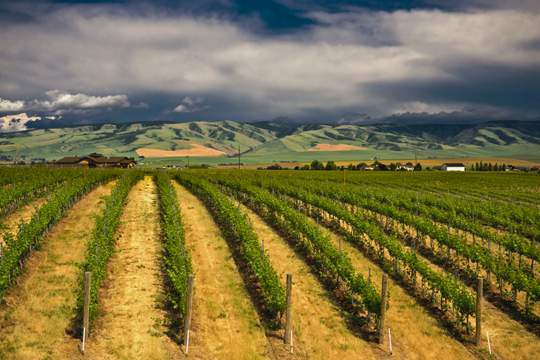 One of the more exciting developments in the Walla Walla Valley in recent years has been the increase in plantings across the valley, including estate sites for a number of wineries. One of them is àMaurice Cellars. àMaurice’s estate vineyard lies adjacent to the winery in the outrageously scenic Upper Mill Creek area of the valley. The area has already proven itself with a number of high quality vineyard plantings, including one of Leonetti Cellar’s sites. At an elevation of 1,450 feet, àMaurice's vineyard was planted in 2006 to 13.5 acres of Merlot, Syrah, Cabernet Sauvignon, Malbec, Viognier, Cabernet Franc, and Petit Verdot. The site is managed by Kenny Hart, who works a number of sites throughout the valley and is also co-owner of Tulpen Cellars. The àMaurice Estate Vineyard saw its first crop in 2008 and a number of estate wines are now percolating through the winery, mostly in the form of wine club offerings. The àMaurice Estate wines are standouts and are notable for having more prominent tannins than are found in their Columbia Valley offerings. The estate wines have colorful names, with the ‘Fred’ Syrah named after a hummingbird that lives in the vineyard. Winemaker Anna Schafer writes, “He sits on the trellis and sips honeysuckle all day…rough life.” The ‘Night Owl’ Red Blend is named after an owl that screeched in the middle of the night while Schafer was inoculating her wines. (Good) An aromatic wine with oak spice, vanilla, and white peaches. The palate is medium bodied and textured with lively acidity. 100% Viognier. Aged 11months in neutral French oak. 14.5% alcohol. 276 cases produced. (Good/Excellent) Pale in color. An aromatically appealing wine with delicate aromas of spice, yellow apple, and candy corn. The palate is medium bodied with a drawn out feel. 100% Chardonnay. Aged 11 months in French oak (20% new). 13.5% alcohol. 136 cases produced. (Good/Excellent) Intriguing aromas of boysenberry, spice, mineral notes, and a light floral note. The palate is very pretty with soft, lip smacking fruit flavors and grainy tannins. 100% Syrah. Boushey, Lewis, and àMaurice Estate vineyards. Aged in neutral French oak. 231 cases produced. (Excellent) Named after a hummingbird that lives at the winery’s vineyard, this estate Syrah has pretty aromas of red raspberries, high toned floral notes, and high toned herbal notes. The palate has perfumed red fruit flavors and tacky tannins. 100% Syrah (Tablas Creek and Phelps Clones). Aged 11 months in French oak (20% new). 14.5% alcohol. 233 cases produced. (Exceptional) The aromatics pop on this wine with bright red raspberries, ground cranberries, a touch of pepper, and a light herbal note. The palate has beautifully pure fruit flavors and a real sense of vibrancy. 72% Syrah, 28% Grenache. 14.5% alcohol. Aged 11 months in French oak (20% new). 14.8% alcohol. 173 cases produced. (Excellent) Aromatically quiet at present with light floral notes and red fruit. The palate has restrained, pure red and black fruit flavors. 100% Syrah (Tablas Creek and Phelps Clones). Aged 11 months in French oak (20% new). 14.5% alcohol. 367 cases produced. (Good) A dark, glass staining wine with spice, resin, pine, and light herbal notes. The palate is full of plum flavors and puckering tannins. 100% Malbec. Aged 35 months in French oak (40% new). 14.6% alcohol. 48 cases produced. (Excellent) Dark in color. A brooding wine with ripe plum, spice, and light herbal notes. The palate is full of sweet, ripe fruit flavors that linger on the finish. 100% Malbec. Aged 24 months in French oak (40% new). Gamache Vineyard. 324 cases produced. (Exceptional) An immediately appealing wine with high toned floral notes, herbal notes, chocolate, and dark fruit. A deliciously rich palate full of ripe dark fruit flavors. 47% Cabernet Sauvignon, 33% Merlot, and 20% Cabernet Franc. Sagemoor, Bacchus, Dionysus, Gamache Vineyard, Weinbau, and Tokar vineyards. Aged 24 months in French oak (100% new). 469 cases produced. (Exceptional) An aromatic wine with high toned raspberries, cranberries, and a light resinous note. The palate is dense and rich, tightly wound at present with firm tannins. A very distinctive wine from this new vineyard site. Give two plus years. 43% Cabernet Sauvignon, 43% Merlot, 7% Petit Verdot, and 7% Cabernet Franc. Aged 35 months in French oak (40% new). 14.7% alcohol. 110 cases produced. (Excellent/Exceptional) An aromatically brooding wine with high toned floral notes, herbal notes, tar, and dark fruit. The palate is full of ripe tannins and plump, dark fruit flavors. 64% Cabernet Sauvignon, 27% Petit Verdot, and 9% Cabernet Franc. Aged 35 months in French oak (40% new). 14.8% alcohol. 247 cases produced. Few Washington wineries have the heritage that Seven Hills Winery does. 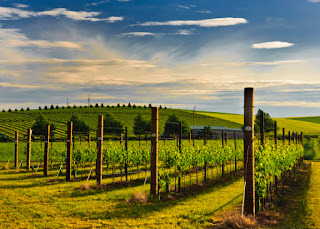 The winery was established by Casey McClellan in 1988 and is now located in downtown Walla Walla adjacent to the Whitehouse-Crawford Restaurant. While long-tenured wineries can sometimes be taken for granted, this would be a mistake for this consistent standout producer. Over the years, McClellan has made his mark offering wines that are notably lower in alcohol and use less new oak than many of the state’s wineries. Seven Hills is also a winery that takes the term ‘reserve’ seriously, with the 2009 Red Mountain Reserve Cabernet only the winery’s eighth reserve wine in twenty-four vintages. All reds sampled at 69 degrees. (Good) An aromatic wine with red apple, white peach, and honey. The palate is just off-dry with racy acidity and a drawn out finish. 100% Riesling. Evergreen, Willard, and Upland vineyards. Aged in stainless steel. 10.1% alcohol. 5,000 cases produced. Sampled at 59 degrees. (Good) Pale lemon yellow. An aromatic wine with white flowers, ripe peaches, and spice. The palate is medium-plus bodied with a viscous, rich feel. 100% Viognier. Talcott (80%) and Clifton vineyards. Fermented and aged in French oak. 14.2% alcohol. 970 cases produced. (Good/Excellent) Pale lemon yellow. A moderately aromatic wine with floral notes and spice. The palate is medium bodied with a rich mouthfeel. (Good) A moderately aromatic wine with high toned herbal notes, crushed nuts, and red fruit. The palate has ripe fruit flavors and chalky tannins with bright acidity. 94% Merlot and 6% Cabernet Sauvignon. Aged 16 months in American, European, and French oak. 14.6% alcohol. 560 cases produced. (Good) An aromatically intriguing wine with shaved almond and high toned herbal notes. The palate is tart and fresh with a firm backbone of tannins. 86% Merlot, 14% Cabernet Sauvignon. Aged 20 months in French oak (40% new). 14.6% alcohol. 325 cases produced. (Excellent) A lightly aromatic wine with high toned aromas of lavender, tar, and chocolate. The palate is big and bold with ripe cherry flavors and broad, firm tannins. 100% Petit Verdot. McLellan Estate Vineyard. Aged 19 months in French oak (40% new). 14.3% alcohol. 83 cases produced. (Exceptional) An aromatically appealing wine with cocoa, spice, floral notes, red and black fruit, and light herbal notes. The palate is bold and rich – a hedonistic delight. 57% Cabernet Sauvignon, 21% Petit Verdot, 8% Cabernet Franc, 7% Merlot, and 7% Malbec. Aged 23 months in French oak (50% new). 14.5% alcohol. 171 cases produced. (Excellent) A dark, glass staining wine that jumps up with ripe blue plums and spice. The palate has plump, ripe fruit flavors and velvety tannins. 100% Malbec. Windrow, McClellan, and Minnick vineyards. Aged in Hungarian oak (35% new). 13.8% alcohol. 396 cases produced. (Exceptional) Aromatically locked up at present with mineral notes, tar, dark fruit, and high toned spices. The palate has chewy tannins and bold, dark cherry flavors. Give at least two years and should age as long as you care to keep it. Artz Vineyard. 14.5% alcohol. Aged 30 months in French oak. 49 cases produced. 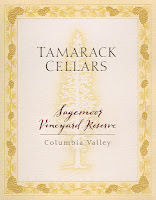 Located in the airport region of Walla Walla, Tamarack Cellars was founded in 1998 by Ron and Jamie Coleman. The winery is in a renovated firehouse, which gives rise to the name of Tamarack’s crowd-pleasing Firehouse Red (read a review of the 2010 vintage of this wine here). While widely distributed wines like the Firehouse Red have helped the winery make a name for itself around the country, the winery’s reserve wines are the stuff of insiders. These wines are made in limited production, with many rarely seeing distribution outside of the winey. 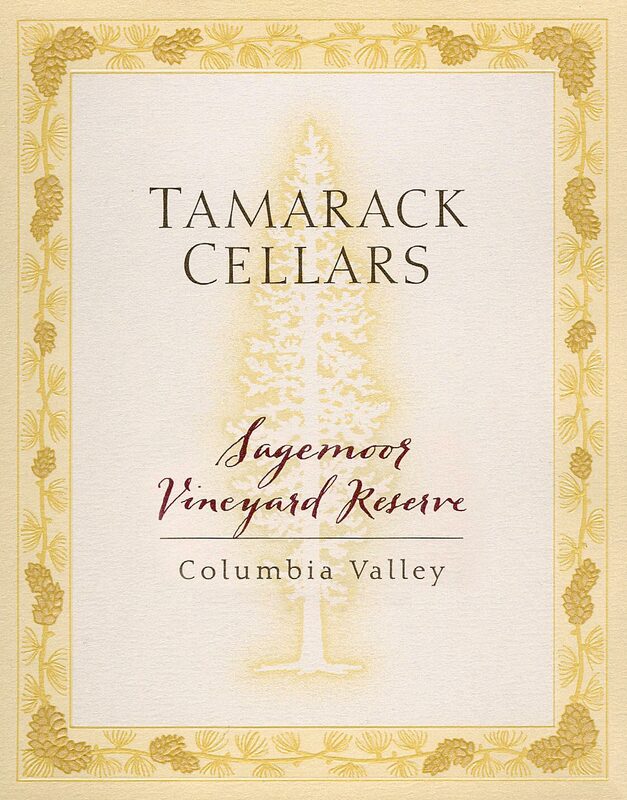 The Tamarack vineyard-designated reserve wines are all extremely high quality and are worth seeking out on any visit to the valley. All red wines sampled at 68 degrees. (Good) Pale lemon yellow. An aromatically appealing wine with pear, melon and spice. The palate is palate is textured and well balanced with a lingering finish. (Good/Excellent) A moderately aromatic wine with raspberry and cranberry notes. The palate is crisp and tart with mouthwatering acidity. (Excellent/Exceptional) An aromatically appealing wine with very pure floral and cherry notes. The palate is broad and restrained with lip smacking tannins. (Excellent) An aromatically appealing wine with blue and red fruit and spice. The palate is full of delicious fruit flavors with a firm grip of tannins. This is not your mother’s Merlot! 81% Merlot, 11% Cabernet Sauvignon, and 7% Cabernet Franc. Taptiel, Wallula, Weinbau, DuBrul, Ciel du Cheval, and Dionysus vineyards. Aged 12 months in American, French, and Hungarian oak. 14.48% alcohol. 1,036 cases produced. (Excellent) A moderately aromatic wine full of high toned aromas of herbal notes, cherry, and poblano pepper. The palate is loaded with sweet cherry flavors with a firm backbone of tannins. 86% Cabernet Sauvignon, 7% Merlot, and 4% Cabernet Franc. Aged in French oak (65% new). 14.53% alcohol. 1,320 cases produced. (Exceptional) An aromatic dazzler with pink peppercorn, herbal notes, and cherry. The palate is ripe and generous, full of cherry flavors and exceptionally well integrated tannins leading to a long finish. 62% Cabernet Sauvignon, 31% Merlot, and 7% Cabernet Franc. Aged 22 months in French oak (67% new). 14.56% alcohol. 245 cases produced. (Exceptional) Noticeably different from its 2007 vintage counterpart, this wine is considerably more restrained with very high toned herbal notes, licorice, and spice with an under layer of cherries. The palate is densely packed with tightly wound fruit flavors with ripe, plump tannins. A beautiful wine with excellent cellaring potential. 62% Cabernet Sauvignon, 31% Merlot, and 7% Cabernet Franc. Aged 22 months in French oak (67% new). 14.1% alcohol. 228 cases produced. (Excellent/Exceptional) An aromatically intriguing wine with a lot of sophistication with spice box, high toned herbal notes, and cherries. The palate is soft with seductive fruit flavors and velvety tannins. Persists on the finish. 90% Cabernet Sauvignon, 5% Merlot, and 5% Carmenere. Aged 22 months in French oak. 14.5% alcohol. 108 cases produced. (Excellent) A perfumed wine with floral notes, high toned spice, cigar box, black cherry, and chocolate. The palate is tightly wound with rich cherry flavors and plush tannins. 50% Cabernet Sauvignon, 25% Merlot, and 25% Cabernet Franc. Aged in French oak (67% new). 14.63% alcohol. 182 cases produced. 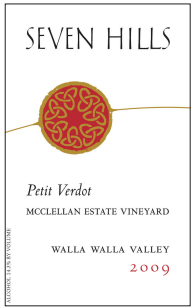 (Exceptional) Leaps up aromatically with blue and black fruit, high toned spices, and mineral notes. The palate is incredibly tightly wound but shows beautiful tannin refinement with a thirty-plus second finish. 57% Cabernet Sauvignon, 29% Merlot, and 14% Cabernet Franc. Aged 22 months in French oak (75% new). 14.4% alcohol. 134 cases produced. (Excellent) An aromatically expressive wine with blueberry, floral notes, mineral notes, and a light meaty streak. The palate is loaded with blue fruit flavors and grainy tannins. Pepper Bridge is located in the scenic southern section of the Walla Walla Valley, not far from the Washington-Oregon border. 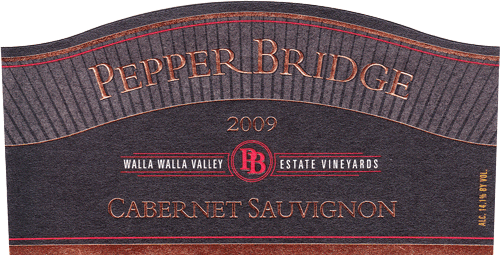 The winery focuses all of its efforts on fruit from Pepper Bridge Vineyard, which abuts the winery and tasting room, and Seven Hills Vineyard over in the western section of the valley. Each of the wines below tells a story about these two vineyard sites through the eyes of winemaker Jean Francois Pellet. These are among the area’s more age-worthy wines allowing the story to be told over and over again. (Excellent/Exceptional) An aromatically appealing wine with earth, incense, plum, cherry, and floral notes. The palate is incredibly refined and understated with polished tannins and a plush texture. 85% Merlot, 10% Cabernet Franc, and 5% Malbec. Seven Hills (55%) and Pepper Bridge vineyards. Aged 17 months in French oak (42% new). 14.1% alcohol. 731 cases produced. (Excellent/Exceptional) An aromatically compelling wine with floral notes, earth, dust, and tea leaves. The palate has a plush, soft, ripe mouthfeel with smooth tannins and a lingering finish. 57% Cabernet Sauvignon, 40% Merlot, and 3% Cabernet Franc. Aged 17 months in French oak (46% new). 14.1% alcohol. 473 cases produced. (Excellent) An earthy wine full of incense, cherry, and blackberry. The palate is compact at present with a ball of cherry flavors and broad tannins. Give one to two years. 55% Merlot, 24% Cabernet Sauvignon, 19% Malbec, and 2% Petit Verdot. Aged 21 months in French oak (47% new). 14.1% alcohol. 444 cases produced. (Excellent/Exceptional) Aromatically locked up right now with tea leaves, dark cherries, cocoa, and earth. The palate is tightly wound with dark fruit flavors and enough tannins to go the distance. Give two years. 79% Cabernet Sauvignon, 13% Merlot, 4% Cabernet Franc, 2% Malbec, and 2% Petit Verdot. Seven Hills (65%) and Pepper Bridge vineyards. Aged 19 months in French oak (45% new). 14.1% alcohol. 2,050 cases produced. The cool 2010 vintage challenged wine growers and winemakers alike. However, early returns show this to be one of the finest vintages of the last decade, particularly for Rhone-style wines. Indeed, both of the 2010 Syrahs are beautiful wines that should age well in the cellar in the years to come. An equal blessing is that the winery held the line on its pricing, despite the lower crop. In this, Amavi Cellars continues to provide exceptional value for the price. (Good/Excellent) Dark in color. An aromatic wine with boysenberries, floral notes, and orange peel. The palate is tart with a gauzy, plush feel. 100% Syrah. 52% Les Collines, 35% Seven Hills, 13% Pepper Bridge. Aged in French oak (14% new). 14.5% alcohol. 1,281 cases produced. (Excellent/Exceptional) Dark in color with a purple rim. Aromatically restrained at present, this wine shows blueberries, blackberries, a light meaty streak, and high toned violets. The palate has incredibly pure, restrained fruit flavors that linger on the finish. 100% Syrah. Aged 16 months in French oak (14% new). 14.5% alcohol. 355 cases produced. As always, thanks Sean. Your comments on Tamarack are spot on, I had a so so perception of them because I see their Firehouse Red, which I like btw, all over glass poor lists. When I visited the winery last June I was blown away by their upper end wines. They were all fantastic and Tamarack definitely stood out as one of the best stops of the weekend.